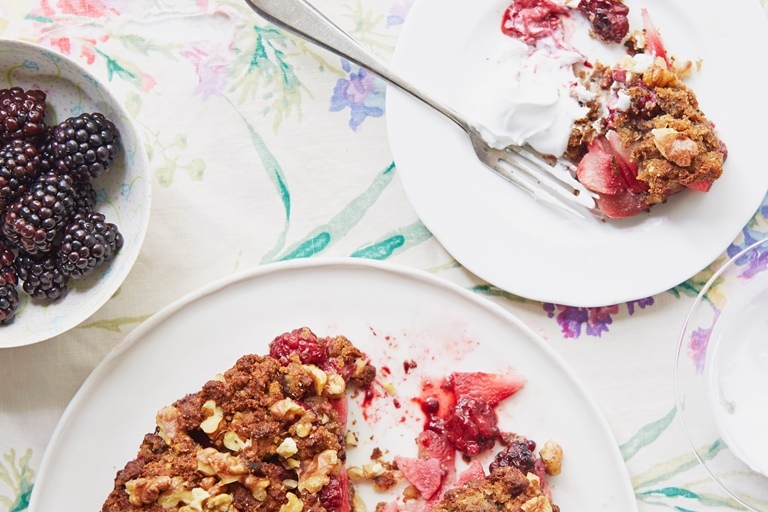 Part apple crumble, part gluten-free cake, this delicious bake from Henrietta Inman skillfully straddles the line between baked treat and comforting dessert – meaning you can eat it whenever you fancy! Serve without yoghurt for a fantastic vegan dessert. I love slicing this cake in front of friends, each piece revealing the white apple slices dyed by the purple blackberry juices, listening to the satisfied 'oohs' and 'aahs' as people delve into the three layers of crunchy crumble toppings, sweet fruit and deliciously gooey cake. It is warming, comforting, autumnal wholefood at its best.